﻿ Stand-Up Paddleboarding - what is it? Stand-Up Paddleboarding - what is it? 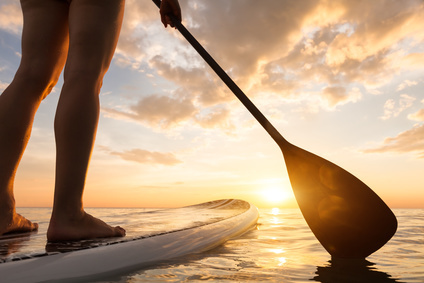 Also called Stand-Up Paddle Surfing, this sport consists of standing on a wide board resembling a surfboard and using a paddle to propel yourself along. This discipline naturally originates from Polynesia. It appears easy but does require some muscle strength and (very!) good balance. It is even said that it is at the origin of surfing, not vice-versa! Whether you’re a novice or fancy a peaceful activity, this activity is open to nearly everyone and is a good way of exploring the Riviera coast. Stand-Up Paddleboarding is an easy activity if you want to get a suntan in the Var’s summer, stay on form, get back on top of the world and even… go fishing (remember to take along a snack, life jacket and telephone). You will find paddleboards to hire for a full or half day just a few km from the campsite on most of the beaches of Hyères and La Londe.